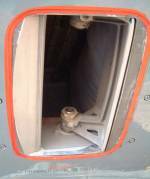 The aircraft is pressurised by bleed air supplied to the packs and controlled by outflow valves. Cabin altitude exceeds 13,875ft CPCS; 15,800ft DCPCS. Cabin rate of climb or descent exceeds 1890 sea level fpm CPCS; 2000 sea level fpm DCPCS. Loss of AC power (transfer bus 1) to auto computer for more than 3 secs CPCS. Loss of DC power (DC bus 1/2) to auto computer DCPCS. Differential pressure exceeds 8.3 psi CPCS, 8.75 psi DCPCS. Other fault in pressurisation controller. 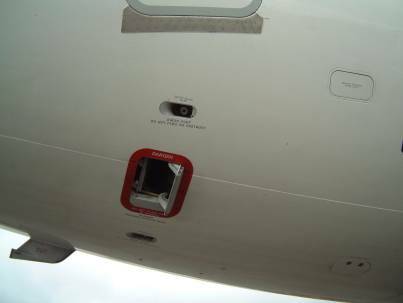 Cabin Pressure Control System (CPCS) installed in a 737-200C. Notice the extra SMOKE CLEARANCE controls. Digital pressurisation controllers have two automatic systems (AUTO & ALTN) instead of a standby system, these alternate every flight. If the auto system fails, the standby / alternate system will automatically take over. The AUTO FAIL light will remain illuminated until the mode selector is moved to STBY / ALTN (tidy but not necessary). On CPCS panels, the cabin rate selector, for use in standby mode, adjusts cabin rate of change of altitude between 50 and 2000fpm, the index is approx 300fpm. If you have to return to your departure airfield, do not adjust the pressurisation panel. 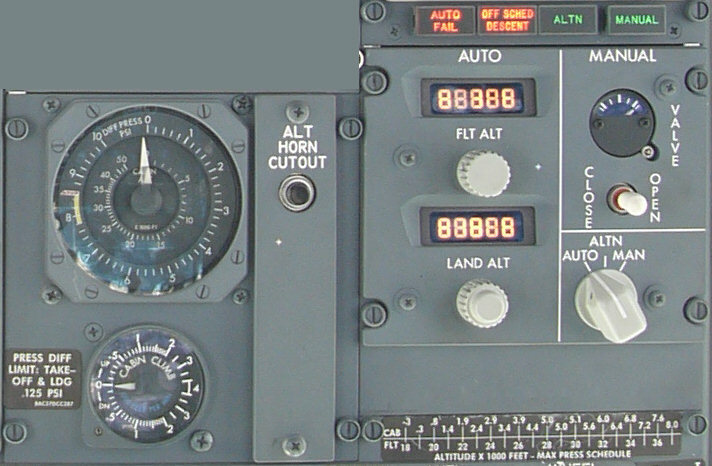 You will get the OFF SCHD DESC light, but the controller will program the cabin to land at the take-off field elevation. If the flight alt selector is pressed, this facility will be lost. “Moving the switch towards the centre of the aircraft keeps the air inside." The 737NG pressurization schedule is designed to meet FAR requirements as well as maximize cabin structure service life. The pressurization system uses a variable cabin pressure differential schedule based on airplane cruise altitude to meet these design requirements. At cruise altitudes at or below FL 280, the max differential is 7.45 PSI. which will result in a cabin altitude of 8000’ at FL280. At cruise altitudes above FL280 but below FL370, the max differential is 7.80 PSI. which will result in a cabin altitude of 8000’ at FL370. At cruise altitudes above FL 370, the max differential is 8.35 PSI. which will result in a cabin altitude of 8000’ at FL410. This functionality is different from other Boeing models which generally use a fixed max differential schedule thus can maintain lower cabin altitudes at cruise altitudes below the maximum certified altitude. In all 737's the pressurisation system ensures that the cabin altitude does not climb above approx 8,000ft in normal operation. However in 2005 the BBJ will be certified to a reduced cabin altitude of 6,500ft at 41,000ft thereby increasing passenger comfort. The payback for this is a 20% reduction in airframe life cycles, ie from the standard 75,000 down to 60,000 cycles. This is not a problem for a low utilisation business jet but would be unacceptable in airline operation where some aircraft are operating 10 sectors a day. The cabin altitude warning horn will sound when the cabin altitude exceeds 10,000ft. 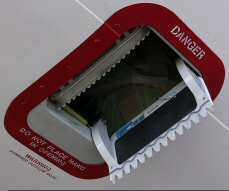 It is an intermittent horn which sounds like the take-off config warning horn. It can be inhibited by pressing the ALT HORN CUTOUT button. Note the pax oxygen masks will not drop until 14,000ft cabin altitude although they can be dropped manually at any time. 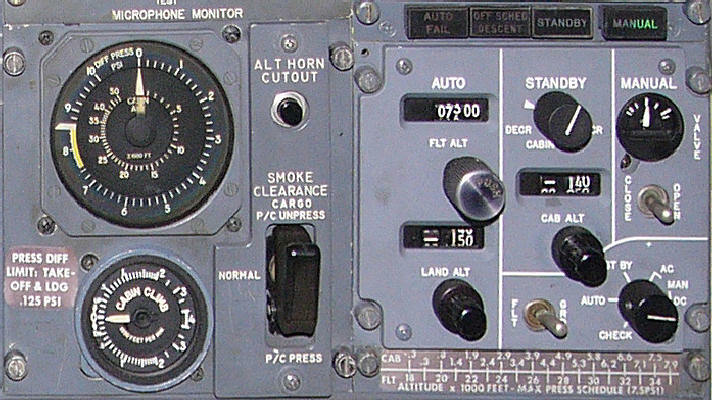 Following the Helios accident where the crew did not correctly identify the cabin altitude warning horn, new red "CABIN ALTITUDE" and "TAKEOFF CONFIG" warning lights were fitted to the P1 & P3 panels to supplement the existing aural warning system. This is a customer option for operations into airfields with elevation of up to 14,500ft (12,000ft on some versions). There are also enhancements to the DCPS, an extra hour of emergency oxygen and the cabin altitude warning horn is inhibited. Controlled by the pressurisation system. Regulates the cabin pressure by adjusting the outflow of cabin air. Early outflow valves (shown here) opened into the fuselage. Later outflow valves opened out from the fuselage. From Dec 2003 onwards, the main outflow valve was given teeth to reduce aerodynamic noise. Its frightening appearance should also help to deter people from putting their hands in the opening. These two valves, located above and below the main outflow valve, protect the aircraft structure against overpressure if the pressurisation control system fails. they are set at Originals 8.5psi, Classics: 8.65psi , NG's: 8.95psi. Prevents vacuum damage to aircraft during a rapid descent. It is a spring loaded flapper valve that opens inwards at -1.0psid. You can check this on a walkaround by pressing it in like a letterbox. Open on the ground (check this on a walkaround) to provide E&E bay cooling and also in-flight at less than 2psi differential pressure. You can often hear this valve opening on descent when the differential pressure passes 2psi. The OEV also opens when the recirculation fan (R recirc fan on the 8/900) is switched off to assist in smoke clearance. Strictly speaking, this is an exhaust port. The actual Flow Control Valve / Overboard Exhaust Valve is located further upstream. 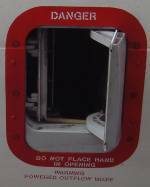 This is is a vent for the E & E bay air after it has been circulated around the forward cargo compartment when in-flight (The E & E bay air is exhausted from the flow control valve when in the ground). The valve opens when the recirculation fan (R recirc fan on the 400) is off (smoke clearance mode) or when the main outflow valve is not completely closed (ie low diff pressure). 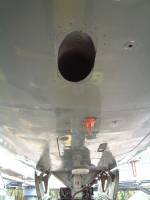 It is located just below and aft of the fwd passenger door.